If you’ve bought a tomato recently you’ve been reminded that while it may be hot outside it’s far from summer. Though plump and red, it’s only skin deep and the tomatoes that have tempted me into purchasing them lack the flavor of the late summer tomato that I dream about all year. While it’s hard to beat traditional bruschetta with fresh tomatoes and basil, there are plenty of options for topping toasted bread. Take this white bean bruschetta. I combine slowly simmered white beans with fresh basil, roasted bell peppers, shallots, and garlic and toss it all with extra virgin olive oil, salt and pepper. Served atop a still warm crostini, a Parmesan shaving adds umami and a sophisticated touch making this an ideal appetizer for your late spring and early summer outdoor entertaining. Although you certainly don’t need a party to whip up a batch of these white beans. While we enjoyed the beans as bruschetta with cocktails, my husband added a couple of spoonfuls of the leftovers to his sandwich the next day and I ate them straight from the fridge as a light lunch. The recipe below requires only two cups of cooked beans, but if you are going to go to the trouble of cooking dried beans you should make a full one pound bag. Add extra beans to salads or soups, purée them with roasted garlic and olive oil for a full-flavored dip, or freeze them for later use. And when the time comes, a chopped ripe tomato would make an excellent addition to this dish. Happy cooking! Place a rack in the top third of the oven and turn the broiler on high. Cover a baking sheet with aluminum foil and place the red pepper on top of it. Place the baking sheet on the rack in the top third of the oven. Watch the pepper carefully and turn as needed. Roast the pepper for about 15 to 20 minutes. Note: If you have gas burners, you can roast the peppers on your stovetop by setting the peppers on top of the gas burner and rotating them as needed with tongs. Done in this manner, the peppers will roast faster than those roasted in the oven. When the skin is blackened and puckered, remove the pepper from the oven and place it in a bowl. Immediately cover the bowl with plastic wrap and let the pepper sit for at least 10 minutes. Reduce the oven temperature to 400 degrees. After ten minutes, remove the pepper from the bowl and use your fingers to gently remove the skin. Cut the peppers in half and discard the inner membrane and seeds. Chop the peppers and place them in a small bowl with the cooked white beans, shallot, garlic, and basil. Add olive oil to taste and season with salt and pepper. Let the flavors marinate while you prepare the crostini. Brush the bread slices with the olive oil and place them on a baking sheet. Bake for 10 minutes or until lightly browned and toasted. Immediately upon removing the crostini from the oven rub each slice with the halved garlic. 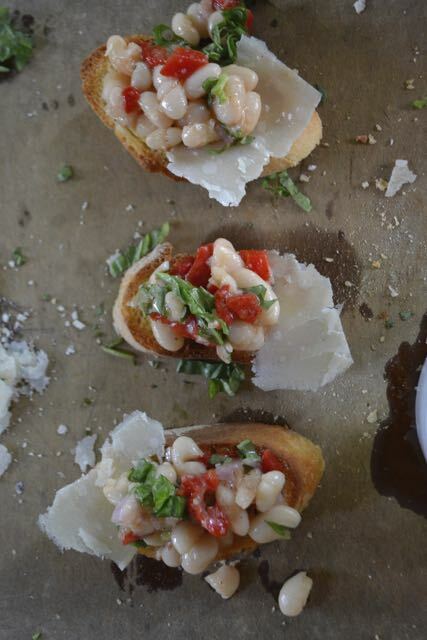 When ready to serve, place a parmesan shaving atop each crostini and then add a generous spoonful of white beans. Serve immediately. Pick over the beans for pebbles or funky looking beans. Discard both. If you’ve planned ahead, place the sorted beans in a large bowl and add about 3 times as much water as you have beans. Cover, place in the fridge, and let soak for at least 8 hours or overnight before proceeding to the next step. If you’ve only got a couple of hours, you’ll want to quick soak your beans. Add the beans to a large pot and cover with cold water (about 2-inches above the beans). Bring the water to a boil. Boil for two minutes. Remove the pot from the heat and cover it. Let the beans soak, covered, for one hour before proceeding to the next step. If guests are coming in thirty minutes, send someone to the store. You’ll need to go with canned beans this time. Before using canned beans, be sure to rinse them in order to reduce sodium. Canned beans do not require any additional cooking. After soaking, add the beans to a large pot and cover with about 2-inches of cold water. Bring the water to a gentle boil. Reduce the heat to a simmer and cover the beans. Cook the beans for approximately 1 ½ to 2 hours or until they are soft. Season to taste with salt and pepper. 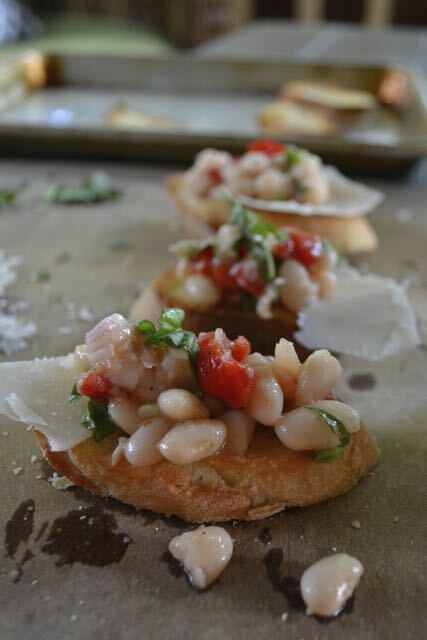 Use beans for white bean bruschetta or freeze them for later use.